Sue Arnold’s quilt collection began many years ago with the purchase of an EBHQ speaker's quilt of a scene of Mendocino, where she now lives. After the first purchase, her collection grew very slowly at first, until SAQA (Studio Art Quilt Association) began auctioning 12”x12” quilts in 2007. The auction supports the organization, including producing quilt shows that travel to many different venues. Each small quilt is a jewel, and appeal in many ways, by design, texture, color, technique or by a connection to the artist. Sue displays them in different arrangements in her home. 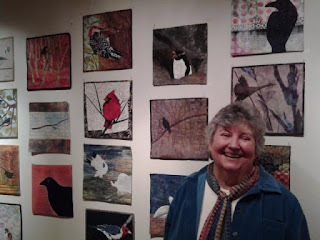 She has also had two one-person shows of her collection at Pacific Textile Arts in Fort Bragg, CA in 2016 and 2017, plus a smaller group of bird-themed quilts in a textile show in Mendocino in 2017. Other quits have been purchased from guild speakers, workshop instructors and from online web sites. It is a pleasure for her to share them in an EBHQ show, where where Sue has been a member for over 35 years.